Register now for ITS online training courses! Europe’s leading intelligent transport systems (ITS) actors have joined forces to deliver ground-breaking training and educational courses now available via an all-new online training platform, hosted on the open source edX software. Registration for the online training platform and courses opened on December 20th. Students will have the chance to learn about ITS and cooperative ITS (C-ITS) services and experience these cutting-edge technologies first-hand with face-to-face training sessions coupled with live demonstrations across Europe. Experienced ITS professionals including ERTICO’s Professor Eric Sampson, Dr Simon Edwards from the University of Newcastle, AustriaTech’s Mobility Manager Katharina Zwick, and Monica Giannini, Senior Project Manager at the International Road Union, will guide students and provide expert advice throughout the courses. 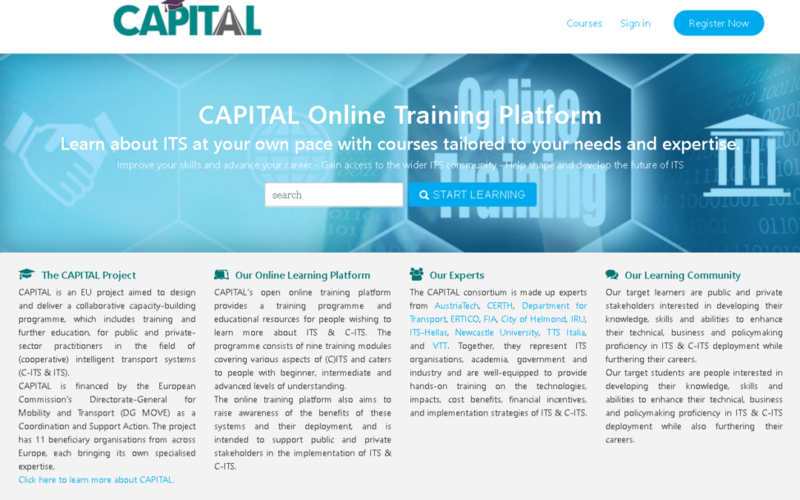 The platform and courses have been developed by a consortium of ITS experts and professionals under the banner of the EU funded project “CAPITAL”. The online training programme consists of nine modules covering various aspects of ITS and caters to all levels. Course topics include: Introduction to ITS, Impacts of ITS, Financial Incentives and Business Models, Data Protection and Guidance on deployment of C-ITS. The first courses will go live in February 2018, so click here now to register and book your spot on one of the courses coming soon. CAPITAL – Collaborative cApacity Programme on ITS Training-educAtion and Liaison is a coordination and support action funded by the EU under the Horizon2020 (H2020) Research and Innovation Framework Programme Grant Agreement No 724106. Its goal is to create a collaborative capacity building community and deployment programme to support public and private stakeholders implementing cooperative (C-) ITS with training and educational resources. The CAPITAL project will assist public and private stakeholders in developing their knowledge, skills, and abilities to build technical, business and policy making proficiency of ITS deployment while furthering their career paths. The project also aims to raise awareness of ITS and C-ITS services. The CAPITAL consortium is made up experts from AustriaTech, CERTH, the UK’s Department for Transport, FIA, City of Helmond, IRU, ITS-Hellas, Newcastle University, TTS Italia, VTT, under the leadership of ERTICO-ITS Europe. Together, they represent ITS organisations, academia, government and industry and are well-equipped to provide hands-on training on the technologies, impacts, cost benefits, financial incentives, and implementation strategies of ITS & C-ITS.